Up-to-the-minute news about UFC STOCKHOLM 2013, taking place Saturday, April 6 at Ericsson Globe Arena in Stockholm, Sweden and airing live in the US on FUEL TV. Verbal agreements are in for all bouts listed below. Due to a cut suffered on his final day of sparring last week, UFC light heavyweight contender Alexander Gustafsson has been ruled unfit to compete by the Swedish Mixed Martial Arts Federation, and has subsequently been pulled from his Saturday main event against Gegard Mousasi. Stepping in for Gustafsson will be his Swedish countryman Ilir Latifi, an 8-2, 1 NC light heavyweight who has won three straight, setting up the opportunity of a lifetime as he battles Mousasi in a three-round bout in his Octagon debut on home turf. 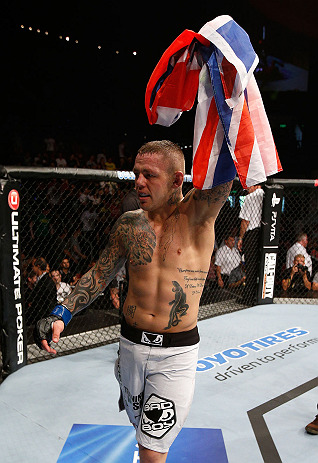 In the UFC on FUEL TV 9 co-main event, Ross Pearson squares off with Ryan Couture. UFC president Dana White was so impressed by the caliber of fights he saw during the taping of TUF 17 that he assured all the competitors that they would get a bout in the UFC. He'll make good on that promise even before the season has finished airing, as cast members Adam Cella from Team Jones and Tor Troeng from Team Sonnen will fight in a middleweight bout at UFC Stockholm April 6. The fight will be on familiar turf for Umea, Sweden's Troeng, who splits his training between Umea, Stockholm and San Diego. Following his victory at UFC 153, TUF 14 winner Diego Brandao faces Pablo Garza as he tries to move up the featherweight ranks. Garza is battle-tested against other top competition and coming off an impressive win over Mark Hominick. It's Europe's best against the world -- With tickets for UFC Stockholm 2013 nearly sold out, intriguing bouts continue to be announced for the early April event. England's Phil De Fries will face the super-athletic Matt Mitrione in a heavyweight matchup, while Rhode Island's "Filthy" Tom Lawlor meets Holland's 12-1 Michael Kuiper at middleweight. In lightweight matchups, 6-1 Ryan Couture will make his Octagon debut against Ultimate Fighter 9 winner and TUF Smashes coach Ross Pearson. Plus, Sweden’s Reza "Mad Dog" Madadi will meet TUF 12 runner-up Michael "The Menace" Johnson. Irish featherweight phenom and knockout artist Conor McGregor is finally making his way into the UFC ranks; welcoming him will be Marcus Brimage, who has gone undefeated in his first three bouts inside the packed division. And the U.K.'s best bantamweight, Brad Pickett, recently listed at number four in the weight class in the UFC Fighter Rankings, takes on the number-nine entry, powerful Mike "The Hulk" Easton. Verbal agreements are in for all of these bouts. A welterweight must-win battle will take place at UFC Sweden 2013 between Swedish up and comers Papy Abedi (8-2) and Besam Yousef (6-1), both of whom are looking for their first Octagon® victory this April. Tickets for the event go on sale Saturday, February 9. Robbie Peralta will face Sweden's own Akira Corassani in what promises to be a striking battle in Stockholm on April 6th. Both fighters have verbally agreed to the UFC featherweight bout. The Ultimate Fighting Championship®, the world's premier organization for mixed martial arts, announced today that it is planning its return to the Ericsson Globe Arena in Stockholm, Sweden on Saturday, April 6. Surging UFC light heavyweight star Alexander “The Mauler” Gustafsson will headline this event in his native Sweden for the second consecutive year, taking on red-hot former STRIKEFORCE® light heavyweight champion Gegard Mousasi of The Netherlands. The five-round main event will pit two of the sport’s best young strikers against one another with the winner moving closer to a date with the UFC light heavyweight champion. Gustafsson recently defeated former UFC champion Mauricio “Shogun” Rua in his last bout. 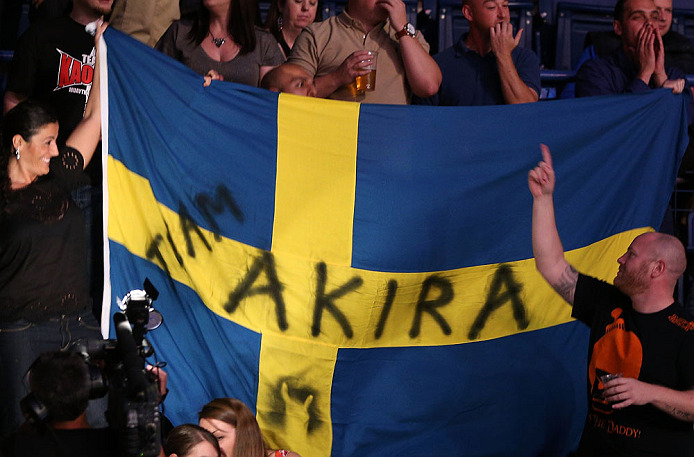 Before his collision with Shogun, the 26-year-old defeated Thiago Silva in front of a record crowd at the Ericsson Globe Arena last April. Meanwhile, Mousasi, 28, is riding back-to-back victories, including a submission win over Mike Kyle earlier this month.